Two photographs of Ed and Alfred Schwanke of Wabaunsee County, Kansas. 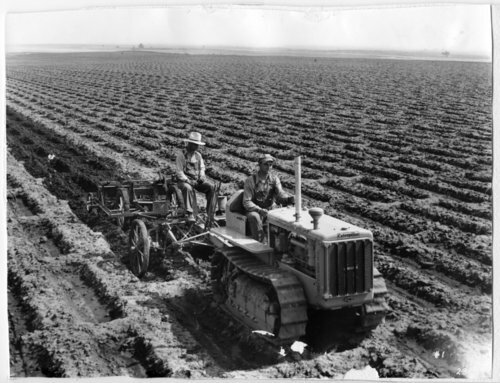 In the first photograph, the pair are seen planting a field as one man sits on a planter being pulled by a Caterpillar D2 crawler tractor. In the second photograph, the pair is harvesting kafir as one man rides a steel-wheeled cutter being pulled by a Caterpillar D2 crawler tractor.